Join the Grog Shop and B Side Lounge for the annual pop-up holiday shop spanning two levels at Grog Shop & Bside on Saturday, December 16th from 11 am - 5 pm. 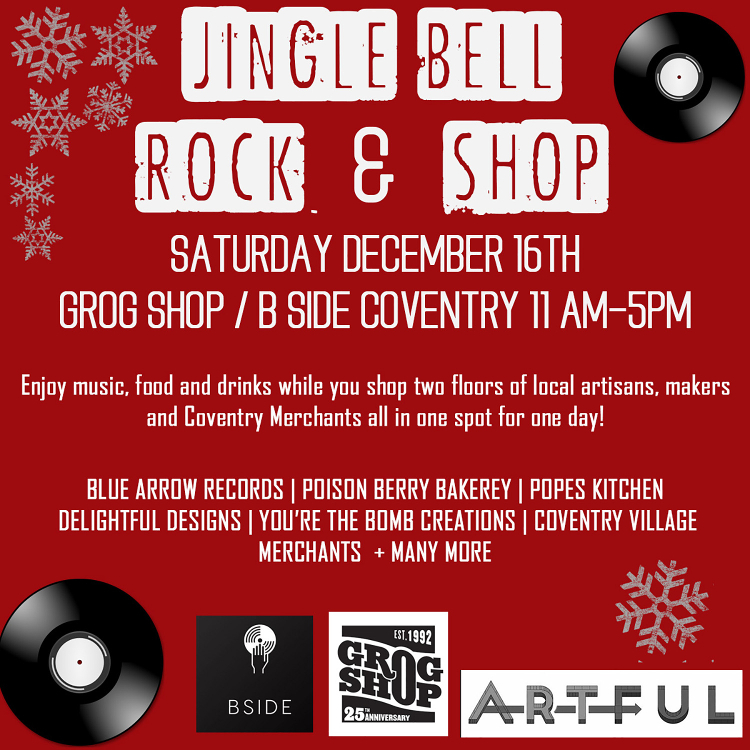 Featuring 40+ local artisans and Coventry Village merchants, our "Jingle Bell Rock-n-Shop" combines the best gifts from the culinary, art, and music scene together into one rad location! Things will really heat-up with our spiked hot chocolate, spicy Bloody Mary's and other taste-testable treats plus DJ's spinning the best holiday music magic all day long. Look forward to seeing your favorites from Blue Arrow Records, Cleveland Pickle, Pope's Kitchen, Poison Berry Bakery, The Cuddle Cult, Sweet Punkette, You're the Bomb Creations and many more.